HafenCity is among the most outstanding urban development projects on the waterfront anywhere. Based on a sophisticated concept, it is expanding the area of Hamburg City by 40 percent. It also has spin-off effects for the existing city center, the whole of the Hanseatic city state with its 1.8 million inhabitants and its surrounding metropolitan region with a population of some five million. Hamburg’s identity as a maritime port city will be underscored in the process and HafenCity itself serve as a blueprint for the development of the European city of the 21st century. It is already regarded as a model for major international urban development projects, although its development timescale continues through to 2025/30. In 2009, Am Sandtorkai/Dalmannkai led the way as the first completed neighborhood in HafenCity’s development. The beginning of 2017 saw the opening of Hamburg’s outstanding and internationally applauded new Elbphilharmonie Concert Hall, designed by Herzog & de Meuron, which sits atop the historic Kaispeicher A warehouse building. The new Hamburg landmark accommodates two concert auditoria, a five-star hotel and around 45 apartments. Close by, completion of the second large neighborhood, Am Sandtorpark/Grasbrook, popular with many young families, followed at the beginning of 2011. The first primary school with kindergarten opened here in 2009, followed in 2013 by the popular Grasbrook park – primary school children were also involved in its design. Meanwhile, on Strandkai to the south, the first buildings completed there in 2009, Unilever headquarters and the Marco Polo Tower, an ensemble of office building and residential multistory, won multiple awards. At the same time, the first open spaces directly adjoining the River Elbe were opened up. Now, on the site to the east, Engel & Völkers’ new corporate head office, incorporating residential construction, has been completed in summer 2018, while building works for the last large unbuilt site in western HafenCity, western Strandkai, got under way in mid-2017. The ensemble will include two towers and several seven-story buildings providing nearly 500 apartments. Finished in 2011, Brooktorkai/Ericus neighborhood is the location of the two largest office users in HafenCity so far, DNV Germanischer Lloyd and the Spiegel group. In northern Überseequartier more than 500 residents have moved in already, many shops and services have opened along Überseeboulevard and it is popular for corporate premises. The U4 subway started regular services to Überseequartier station in December 2012. After Unibail-Rodamco-Westfield assumed responsibility for overall development and realization of southern Überseequartier, the whole utilization concept and urban structure plans were thoroughly reworked in 2015, with new architectural designs for all 11 buildings. Since early 2017 preparation of the building site has been under way, paving the way for construction. By 2022 the site will probably have become Europe’s largest integrated real estate project, offering a total of around 270,000 sqm GFA for retailing, restaurants and bars, a hotel, entertainment, offices, residential and the new cruise terminal. In Elbtorquartier, where the International Maritime Museum opened in 2008 in the historic Kaispeicher B warehouse building and which has been home to the Ecumenical Forum since 2012, around 2,500 students moved into the new HafenCity University (HCU) building on the Elbe embankment in April 2014. Since August 2013, U4 subway services have been serving HCU’s dedicated subway stop, while the flood-protected arcades of the Elbe Arcades and the pier skirting Magdeburger Hafen basin have become a popular meeting place. Adjacent to HCU, the Freeport, Watermark and Shipyard ensemble of buildings have been finished in 2018, comprising a 70-meter office block, and housing further residential and office buildings. And in Am Lohsepark neighborhood, oil corporation Marquard & Bahls moved into its new corporate headquarters on Shanghaiallee in late summer 2016. Lohsepark itself has been finished since July 2016 and has become a popular meeting place for residents and other Hamburgers. At the same time, the part of the denk.mal Hanover Railroad Station memorial that is integrated into the park was also inaugurated. The historic area of the memorial with its listed and partially preserved platform followed in May 2017. While the next cultural and creative users move in since summer 2017 in Oberhafen, over in Baakenhafen, a dense mix of intensive residential and recreational uses with more than 3,000 apartments, green open spaces, workplaces and education and leisure center is taking shape. Building work kicked off on a total five plots in 2017 alone around the central Lola Rogge square; somer other projects are also already under construction on the northern bank of the harbor. At Elbbrücken, HafenCity’s easternmost neighborhood, the infrastructural contours of a densely built, highly urban residential and business district are gradually taking shape, in the wake of the successful conclusion of the urban planning and open space competitions for the area. The tracks of the U4 subway extension, whose 1.3 kilometers mostly run underground, have already been completed. Since the end of 2018 the above-ground Elbbrücken station is in operation. Because it will be linked during 2019 by a glazed pedestrian bridge with another rapid transit (S-Bahn) station, also new, a new public transport junction will be created. 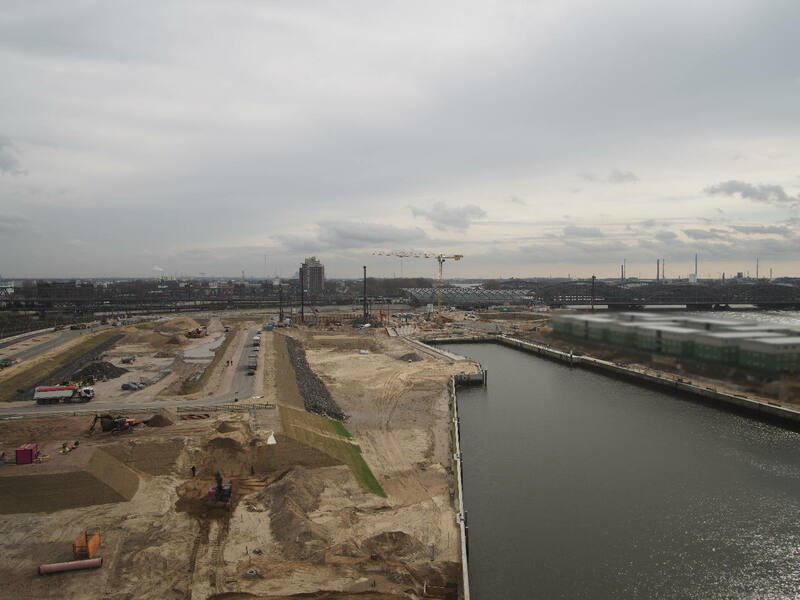 Infilling of the site for Amerigo Vespucci square at the head of Baakenhafen basin is already in place. Real estate development is under way, with acquisition of developers; architectural competitions are in progress. For the first time in Hamburg’s history, an skyscraper will be built directly beside Elbbrücken, where it will serve as a new, southern gateway to the inner-city. The Elbtower, a powerful culmination to HafenCity, will act as a curtain-raiser for the entrée to inner-city Hamburg and the new, adjacent urban development zones. The powerful iconographic design by David Chipperfield Architects incorporates itself respectfully into the new Hanseatic skyline on the banks of the Elbe. Construction could get under way 2021, with opening in 2025 or 2026. In future the Elbtower – privately built and financed by SIGNA Prime Selection AG – will take its place as a matter of course as part of Hamburg’s urban landscape, forming a sculptural urban counterpart to the Elbphilharmonie.